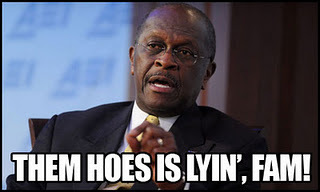 AverageBro: The Herman Cain "Them Hoes Is Lyin', Fam!" Press Conference Open Thread. The Herman Cain "Them Hoes Is Lyin', Fam!" Press Conference Open Thread. Okay, so Herman Cain's got a presser scheduled for 5pm EST to presumably defend himself against the series of heinous allegations leveled at him by past co-workers and random Perkins waitresses. Anyways, since you'll probably get around to watching this sometime soon, drop your observations here. Question: What did you think of Cain's press conference?! ?